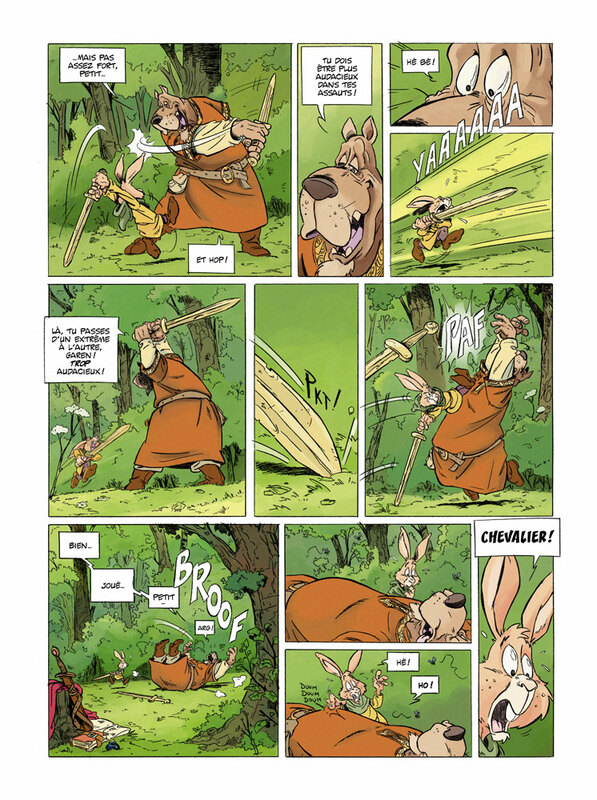 BD Gest’ was founded in 1998 as a reference website devoted to bandes dessinées. In 2003, it started the annual Art awards to pick the best albums of the previous year in seven categories. 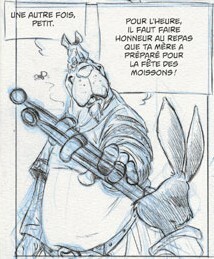 In 2011 more than 2,300 French comics fans voted online on the albums of the previous year. Garen won in the Best Youth category. 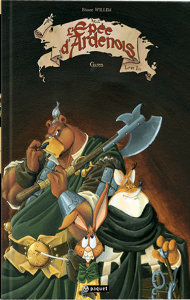 The fourth Blacksad album, L’Enfer, le Silence, also won a BD Gest’ Art 2010, in Best Colors. Chassenoix is as rural as you can get, but it is where Godefroid, the famous Knight of Ardenois (hound), has retired to. Sir Godefroid was one of the legendary Companions of the Dawn, four mighty knights who defeated the armies of evil wizard-king Lord Nuhy and killed him twenty years ago. The Companions disbanded after their victory, and now Sir Godefroid is an old hound relaxing in Chassenoix where the hero-worshipping young Garen has nagged him into giving him simple sword-fighting lessons. They are practicing in the forest one day when they smell smoke, and return to Chassenoix to find it burning and its villagers being slaughtered by men-at-arms commanded by Hellequin of the Cursed Wood (goat), Nuhy’s old general. Sir Godefroid is whom they are looking for, and the elderly knight is quickly overwhelmed and killed and his sword taken. Garen rashly tries to save him and is left for dead by Hellequin. Two days later, Garen is nursed back to health by Master Maugis (owl), an elderly traveling doctor (whom clues suggest may be a wizard). Maugis “guesses” that Hellequin has reappeared after twenty years to attempt to recollect the Black Armor of Nuhy. The leaders of the armies united against Nuhy had distributed his armor among themselves as trophies of their victory, scoffing at the Prophecy of the Black Armor that says that if all of Nuhy’s armor can be recollected by one of his agents, Nuhy will be resurrected with all his dark powers. (And the fact that this legend is being told by a probable wizard suggests that it had better be taken seriously.) Maugis tells Garen that King Tancred of Bohan (leopard) needs to be told immediately that Hellequin is back, and Garen is the only survivor of Chassenoix to do it. This begins the adventure that is already begun. The three kingdoms that united against Nuhy long ago -- Bohan, Herbeutagne and Valdor – are being poisoned against each other by the agents of Hellequin. Bohan’s strong King Tancred the Elder has died, and nobody is sure whether King Tancred the Younger has what it takes to replace him. The Companions of the Dawn reunite, but nobody takes them seriously anymore; two are old men, and one is an untried female. Garen arrives and, after finally getting anyone to listen to him, is thanked for his troubles and brushed off – except by the Companions of the Dawn: Lord Arthus (bear), warden of the Wall of Ambrosius [like the Great Wall of China, separating Bohan’s southern peninsula from the rest of the kingdom]; Sir Grimbert (fox); and Lady La Fouine (marten, who is mysteriously much younger than the other two), who accept him as the protégé of their old comrade. When courtiers persuade King Tancred of Bohan to make a state visit to Elysandre (deer), Dutchess of Herbeutagne to discuss an alliance, the Companions of the Dawn are left behind. And Hellebore has his own agents among the party, both to sabotage the diplomatic mission and to steal the first piece of the Black Armor. In volume 2, The Prophecy, Garen is disgusted by being left behind at the old Wall of Ambrosius to continue his squire’s training, while the leaders plan their new war against Hellebore’s troops. There are signs that Herbeutagne is trying to manipulate the crisis to its own advantage. Suddenly La Fouine arrives at Ambrosius with news that she has discovered an imminent plan to invade peninsular Bohan (dominated by Fort de la Lanterne) during King Tancred’s absence, by a fleet of Skernovite pirates led by their King Rothgard the Bald (hawk), in alliance with Hellebore’s agent, Sigwald the Rash (bull terrier). Garen, the other Companions of the Dawn, and the refugees inside the fort desperately fight off the Skernovite pirates while Count-Bishop Guy (badger) gambles everything on the religious power of his holy order. And Maugis the owl reappears to solemnly proclaim that Garen is the key to the struggle of Good versus Evil. 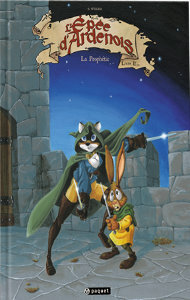 The back cover shows a preview of the cover of volume 3, Nymelle. 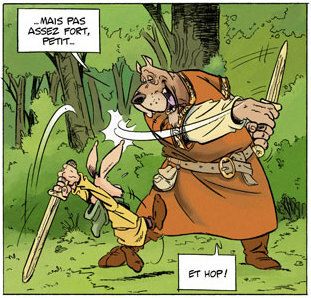 The Sword of Ardenois is exciting, well-plotted, and excellently drawn. It’s a crime that nobody is publishing this series in English, so get the original French. 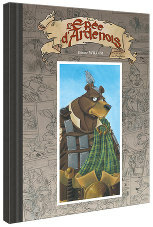 This series is unusual in being offered in two editions; the finished, full-color edition, and a pencil-sketch (crayonnée) edition of Willem’s uncolored line art. The crayonnée editions are €25.00, limited to 1,300 numbered copies. Warning: Tome 1, Garen, was out of print for awhile in Europe. It has just been reprinted, with a new cover. Le Bois des Vierges is a little too bloody and violent for my tastes. If you want to review it for Flayrah, please do. Depends on my feelings towards the series when it's done - I think it's a three-parter? The bloody bits come and go. I was partially interested for some of the critters from Greek mythology, but in vol. 2 they ended up being very unsympathetic characters, and the way they were drawn was on the ugly side. (Ok, personal bias.) My slightly more optimistic review of vol. 1 is still up at Anthrozine. But if you'd like me to do an overview and new review here when it's finished, I shall do so! I can sense the quality in this. But nobody has a tail... for me that's inconsistency. 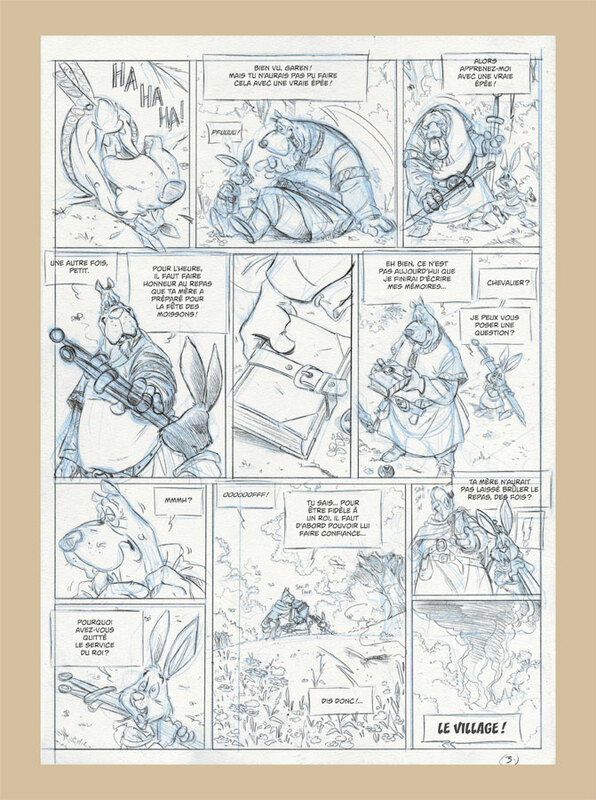 There are no tails in Blacksad, either; and yes, that bugs me. The reason it bugs ME is because, in many cases, there is the simple possibility to make the characters humans.